The official blog of Trading Technologies, your source for professional futures trading software. Somewhat unique among monarchies, instead of a family motto upon accession to the throne, the sovereign of Sweden will adopt a personal motto. This often serves as a national motto as well, and is printed on their 1 krona coins. Upon taking the throne in 1973, the current Swedish monarch, King Carl XVI Gustaf, adopted the motto For Sweden—with the times. This motto reflected his desire for both himself and his country to constantly evolve to adapt to the modern world. When it comes to navigating the recent eurozone crisis, though, in many ways Sweden, along with the other Nordic countries, was ahead of its time. The Swedish economy is showing mixed signals as to whether it is poised to break out of its recent doldrums, or whether a sluggish recovery is threatening to pull it back into recession. Equally uncertain is how the Riksbank, Sweden’s central bank, will react to all of this. On one hand, Sweden’s economy has been showing recent signs of strength. 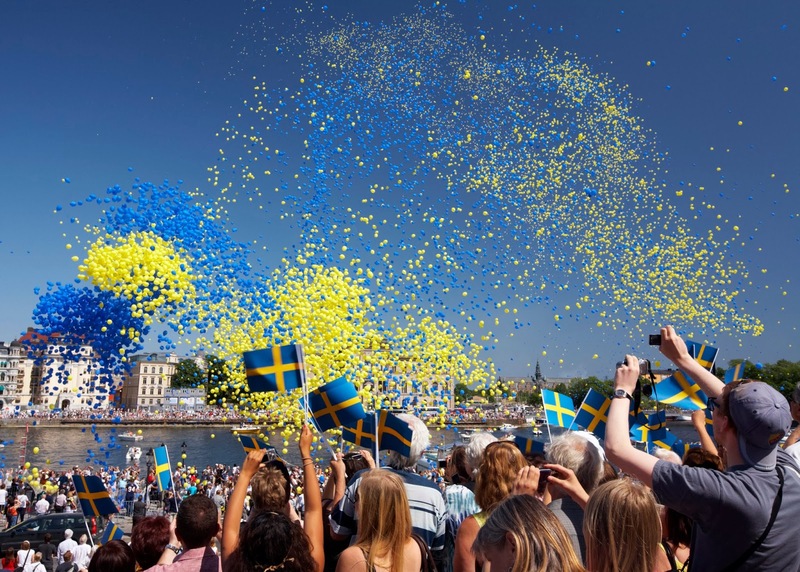 Sweden’s GDP is expected to grow at 1% this year, and will accelerate to 2.4% next year. At that pace, Sweden will overtake the growth rate of fellow Nordic country Norway, and it will grow faster than any other economy in the European Union outside of the Baltic states. In addition, consumer confidence numbers released in November exceeded analysts’ expectations. Sweden’s economy also lacks some of the structural issues seen in other countries. Despite its substantial social welfare programs, Sweden’s government debt as a share of GDP is just 38%, less than either France or Germany. The government budget deficit is running at just 0.3% of GDP, and Sweden’s corporate tax rate of 22% is lower than America’s. OMXS30 performance vs. Euro STOXX and FTSE 100, courtesy Bloomberg. On the other hand, the recently announced third-quarter GDP growth numbers actually came in below expectations. The Swedish economy grew at only 0.1% in the third quarter. This comes on the back of an unexpected drop in consumer prices in October, leading to a looming threat of sustained deflation. To some extent, the Riksbank’s hands are tied with regard to how to combat falling prices. A credit bubble is emerging in Sweden, with household borrowing accounting for more than 170% of family incomes. A lowering of interest rates could help stave off deflation, but at the same time could accelerate the growth of consumer debt. 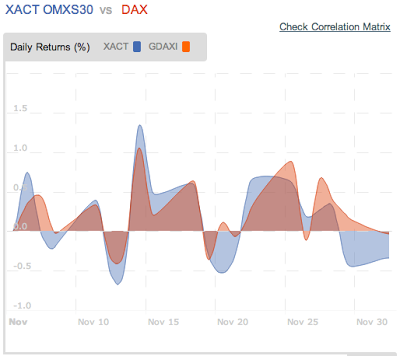 OMXS30 Correlation vs. DAX, courtesy MacroAxis. Half of Sweden’s economy is dependent on exports, with a majority going to Europe. As a result, a slowdown in Europe has a direct impact on the Swedish economy. In an effort to make up for this export slump by increasing domestic consumption, the Swedish government will undertake a stimulus program of 24 billion kronor ($3.7 billion). Perhaps more significantly, we will soon know more about whether the Riksbank will make changes to the country’s repo rate. The central bank has publicly said they will keep the rate at 1% until the end of 2014, expecting inflation to rise to meet the target rate of 2%. Investors seem skeptical though, and it seems as if a rate cut to 0.75% has been priced into the Swedish stocks.The Riksbank will announce its next decision on rates on December 17. Traders looking to take advantage of uncertainty surrounding Sweden’s economy and interest rates can do so on the NASDAQ OMX Nordic exchange. The NASDAQ OMX Nordic exchange is the third largest derivatives exchange in Europe by volume, trading around 600,000 contracts a day on average. It offers single-stock options and futures on Swedish, Norwegian, Finnish and Danish companies such as Volvo, retailer H&M, technology firms Ericsson and Nokia, and banks such as Nordea and SEB. 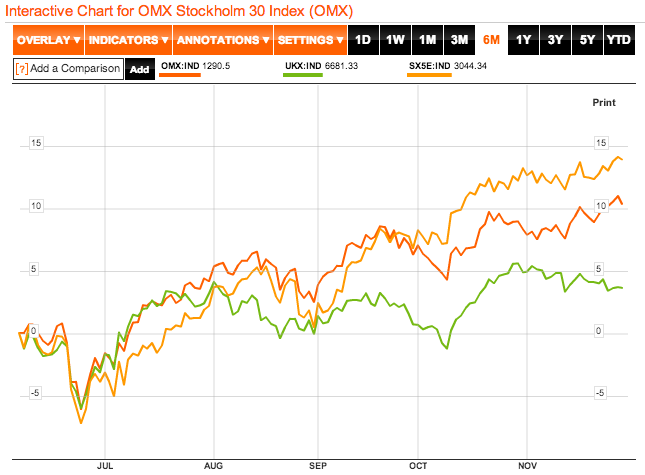 Its headline products are futures on the OMX Stockholm 30 (OMXS30) index of the largest Swedish companies. As of October 2012, foreign investors made up a sizeable portion of the volume on the Nordic markets, with primary interest coming out of North America. One of the key reasons for this as cited by Hans-Ole Jochumsen, president of Nasdaq OMX Nordic, was the Nordic markets’ investment in technology and infrastructure. In October 2010, the NASDAQ OMX Nordic markets announced the rollout of the Genium INET trading system. At the time of the rollout, it was claimed to be the world’s fastest, with sub-100 microsecond latencies and the ability to handle more than one million messages a second. This investment in technology has yielded dividends. According to NASDAQ OMX, last year, half of the volume on the exchange was automated, up from 5% in 2010. Access to the NASDAQ OMX Nordic derivatives markets will be made available through TT in the coming weeks.